(CNN) -- The "disgusting" blob in Fred DeNegri's Diet Pepsi can was probably a frog or toad, the Food and Drug Administration said. 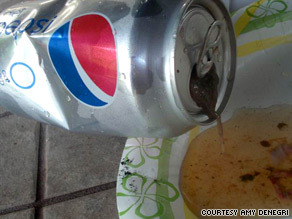 Amy DeNegri took pictures of the can in question right after her husband gagged on its contents. DeNegri was grilling in his backyard tiki bar in Ormond Beach, Florida, when he popped open a can of Diet Pepsi, took a big gulp and started gagging, his wife, Amy, said. He emptied out the can down a sink but something heavy remained inside. He shook the can until something resembling "pink linguini" slid out, followed by "dark stuff," Amy DeNegri said. But the heavy object inside the can never came out, she said. "It was disgusting," said Amy DeNegri, 54. "And now, what started out as a normal afternoon in our tiki bar has blown up into this crazy thing." The DeNegris took pictures before calling poison control and the FDA, which showed up the next day to examine the can in question and collect it for lab testing. "The animal was lacking internal organs normally found in the abdominal and thoracic cavity," the report notes. A second, closed can from the same 36-pack of Diet Pepsi from Sam's Club, was also submitted for testing, according to Amy DeNegri. No abnormalities were detected, the report states. The FDA also conducted an investigation at the local Pepsi bottling plant in Orlando from August 4 to 11 and "did not find any adverse conditions or association to this problem," spokeswoman Siobhan DeLancey said. "We have not determined when or how the contamination occurred," DeLancey said in an e-mail. Pepsi says the FDA results "affirmed" the company's confidence "in the quality of our products and the integrity of our manufacturing system," according to spokesman Jeff Dahncke. "The speed of our production lines and the rigor of our quality control systems make it virtually impossible for this type of thing to happen in a production environment. In fact, there never has been even a single instance when a claim of this nature has been traced back to a manufacturing issue," Dahncke said in an e-mail. "The FDA conducted a thorough inspection of our Orlando facility and found no cause for concern. In this case, the FDA simply was unable to determine when or how the specimen entered the package." When asked if Pepsi believed it was not responsible for the animal getting into the can, Dahncke said, "We have addressed the facts of the investigation and stated our position. It's not appropriate for us to comment beyond that." But the DeNegris say they're hopping mad over Pepsi's handling of the matter. Amy DeNegri said she hasn't heard from Pepsi since the day after the incident occurred, when she spoke with someone over the phone. At first, the woman was apologetic, but DeNegri says her attitude changed after she told her that the FDA was coming to take the can for testing. "She asked for my pictures, I sent them and never heard back," she said. The retired school staffer says she and her husband are seeking legal advice to examine their options. "I want to see Pepsi fess up to it and compensate my husband for the negative publicity they have caused," she said. "I'm easy, but they're the ones that are making it hard."